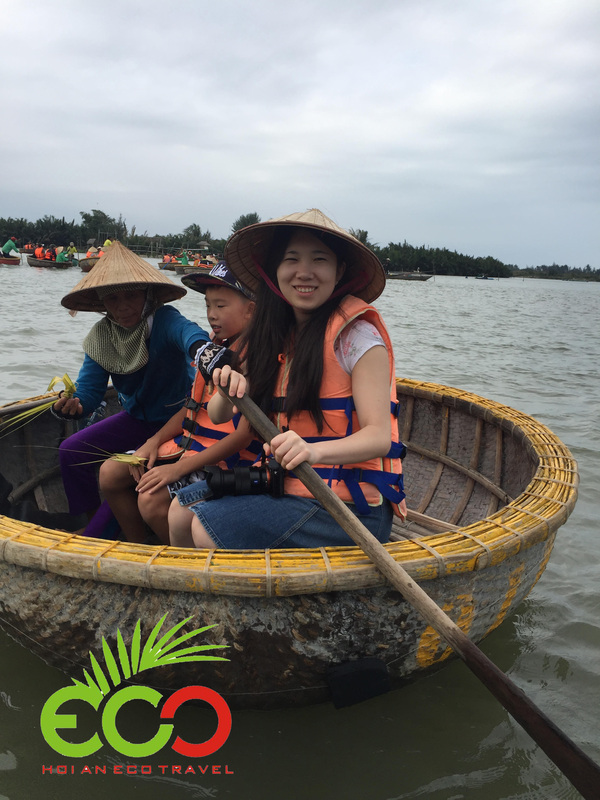 Hoi An Eco Tour is an exploring journey to discover the natural beauty of an ecology system on Bay Mau Coconut Palm Forest. Nowadays, there are many tourists want to find out and experience Hoi An Eco travel, is it special? Of course it’s really interesting and exciting. It makes your trip become so meaningful since join in Hoi an Eco Daily Tours. The Hoi An Eco Tour is located in Cam Thanh Village where has Bay Mau Coconut Palm Forest or Cam Thanh Coconut Palm Forest. 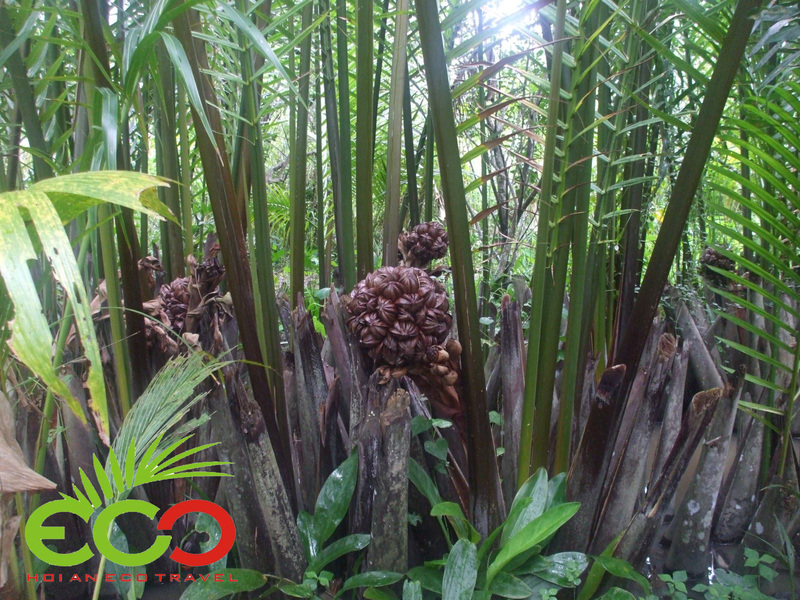 Why is it called Bay Mau, because it has 7-ha palm groove free grown up and developed by them in this area. It has been a revolutionary base of Vietnamese army in the 2 wars fighting with French and American army. It has been a safety hidden place of Vietnamese soldiers during 20 years fighting. Nowadays, it is an ideal place for tourist discovering. 1. How to go to Hoi An Eco Tour? It takes around 45 minutes pick up you from your hotel in Da Nang to Hoi An Eco Tour by car, and 15 minutes from Hotel in Hoi An by taxi. Then you will be transferred to a very cute basket bowl that I am sure you will have never try it before. It is so funny and interested feeling when jump into the basket bowl because you will be fall out to the river if not balance, it always shaking and make you feel so interesting. No worries! It’s never happen accident in this area. 2. Where do you go to Hoi An Eco Tour? 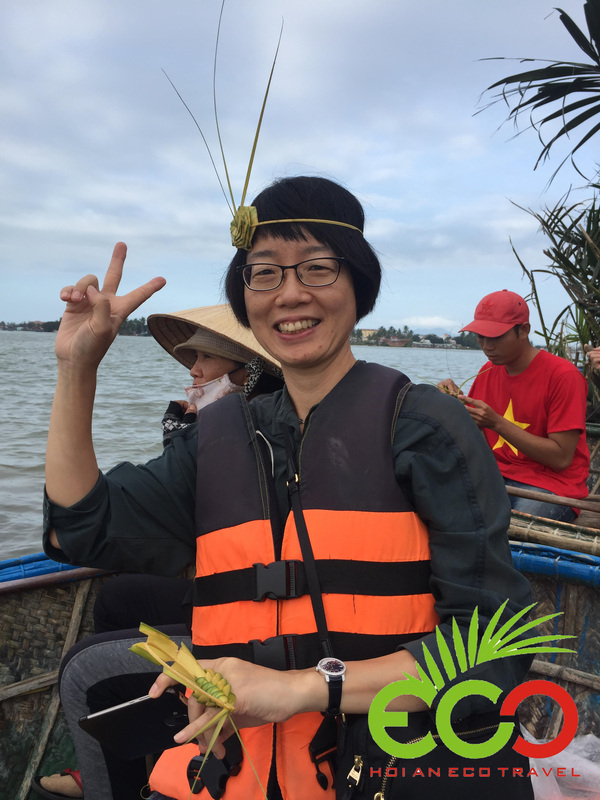 Exploring Hoi An Eco Tour, absolutely, you will join the tour at Cam Thanh Coconut Palm Forest, a very famous site and amazing. The local crew will ride you on a basket bowl to come inside the Coconut Palm Forest where you can discover each beautiful corner and lovely sightseeing in peaceful place, you seem harmony with the nature, seeing the beautiful landscape with green and natural coconut palm, especially you will see the hidden base of Vietnamese soldiers in this place, they did support by themselves for surviving without support from outside because of the American’s enemies cut all the support from the local in this area and the Vietnamese army as well. It will be a lucky for you if your vacation drop on the month of June or July and December or January, because in these months you can see the coconut palm fruit, it is quite strange with the normal coconut fruit plant on the sand. Coconut Palm Fruit has a punch like flowers, so cute, the local people will take a piece of coconut palm fruit for you to try, its taste quite strange, not sweet but tastes very soft and fun with the coconut gut. It is harvest in every 6 months. It is very beautiful like a punch of flowers. 3. What activities will you join in the Hoi An Eco Tour? Since join in Hoi An Eco Daily tour, you will have real experience about a real simple life of local fishing village. The local will teach you how to use the paddle for riding the basket bowl, do you think you can do this job, it is not easy, but you can do in 2 minutes after learning it. You can race basket bowl with your team immediately after then. I am sure that. It is not only interesting, but also will be an unforgotten memory during your trip. Furthermore, you will be gifted many valuable treasures such as diamond ring, necklace, hat, grasshopper, fishes from the coconut palm leaves which was made by the local people in here. Moreover, you will be seen the well performance basket bowl with the skillful local fisher man. It is so amazing performance, please capture this moment by your video. Finally, it is the fishing net performance; the local fisher man will show you how to throw the net to catch the fish, then you will practice how to do, you will be a real fishing man with a new skill of yours. If you love fishing, we will arrange time for you to fishing fish, crab by fishing robs. 4. What special will you eat at Hoi An Eco Tour? Come to Hoi An Eco Tour, You will enjoy the lunch with the local some special dishes just only have in this area. Grilled Shrimp with salt ( Tôm đat rang muoi) is very sweet; it is a specialty in this area, it is only as big as index finger but so delicious. Hot steam clam soup with lemongrass, you will be never forgot this flavor, it’s so fantastic when tastes the first spoon of clam soup, so amazing, the clam is so fresh and have natural sweet, you will want to try another bowl after finish it. Barbecue chicken is very special in Cam Thanh, ít has the original from the local people in here and of course it definitely safety when you try it. It’s not only delicious, but also soft with marinated on chicken, many tourists cannot control themselves when saw this dish and just want to cravings it immediately. 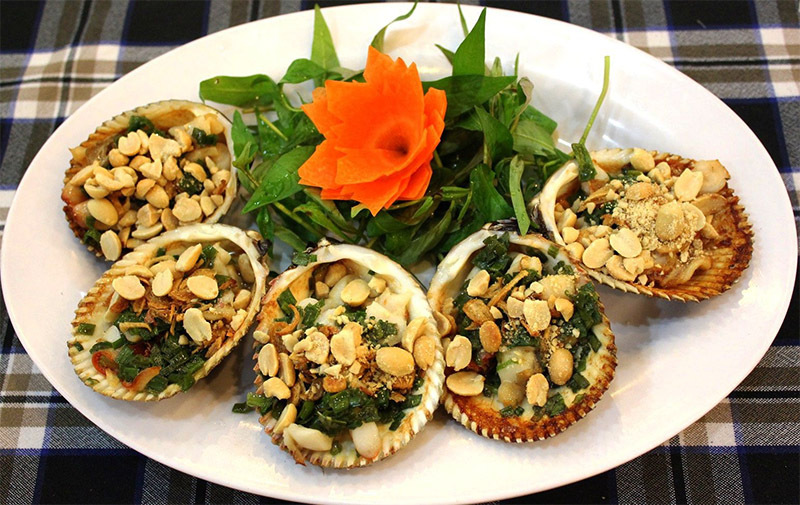 Grill scallop with green onion and bean, wow wow so delicious to who love seafood. 5. How long is it to Hoi An Eco Tour? 6. How much for the Hoi An Eco Tour? Where or what entertainment in Hoi An?